Natural pebble marbles are bound with resin to make pebble tiles or pebble slabs. These stones come from the islands of Indonesia and Bali, and these get separated on the basis of their color and sizes. Pebble stones tiles are much in demand nowadays because of its rough but attractive look. There are different stone pebbles that are used in various applications. Westside tile and Stone is very happy to offer our customers the fabulous full range of Pebble tile décor with lot of options in colors, patterns and textures that allow for use virtually in any project, indoor and out. As each piece of pebble is of different size and shape, so Pebble tiles are good to create unique and exclusive mosaics. Pebble stones are used in various places and for various purposes, both indoors and outdoors. We make them available in different colors and size and are polished to improve the texture and color. These add a great value to your home when adds to flooring. 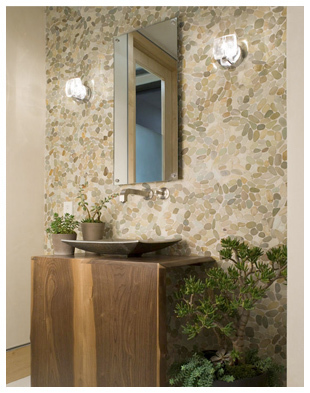 Pebble Tile flooring is used to give a different look to your kitchen, bedroom, or bathroom. In outdoor patios, pebbles are used for landscape, construction and decorative elements. These are used to make walkways in gardens, around pools. It is also used to create a water-smart garden. Pebble stone tile can be perfectly themed with any ambiance from traditional to contemporary. 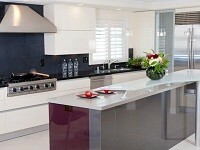 Our showroom offers a huge collection of Pebble tiles available in stock ensuring orders of all sizes can be fulfilled. Give a unique and elegant look to your home with use of Pebble tiles. Extensively, Pebble tiles are used in outdoor areas such as entrance way or walkways of residential and even very popular for commercial exterior also. Pebble Tile can be used in an assortment of ways from your residential kitchen, bathroom, living spaces or exterior designs to large scale commercial projects. We are excited to offer our clients the fabulous full line of Pebble Tile decor solutions to help you turn the ordinary into extraordinary like, Mosaic Pebble Tile, Seaside Pebble Tiles, Stacked Tiles, Micro Pebble Tiles, Recycled Teak Cladding & Porcelain Pebble Tile, Polished Pebble, Flat-Stone Pebble that can be used in various applications. Pebble tile floors is an ideal choice for shower area for the feel of softness underfoot and the gorgeous look they help create in the room. Pebbles are sold in sheets that interlock together and get installed individually. These pebble stone sheets form a seamless floor that gives a look of a pebble strewn beach. Flat pebble tile and River rock pebble flooring stones are the best options you find in choosing pebble tiles for shower floor. Westside Tile and Stone offers variety of designs, colors and types of Pebble Shower Mats. Pebble tiles available in many color options which gives a unique look, endless design options and individual creativity of flooring. Pebble tiles also come in various shapes which suits any section of your home flooring the most. These are less expensive as compared to many other tiles. While choosing the flooring, choose the Pebble tiles according to your need and then choose the color of tiles. We will advise you to buy a sample of flooring tiles and take a walk on them so you will be able to take the decision. These are natural stones so you can choose colors like black, brown, and gray, White Pebble Tile and with different shades. Because it is adaptable to temperature change and ground movement, it is ideal for many indoor or outdoor areas or residential and commercial applications. Pebble Tile extensively used in outdoor such as walkaways, decks, pools or fountain, flooring, and other applications. Checkout Best Design Ideas of Pebble Tile. 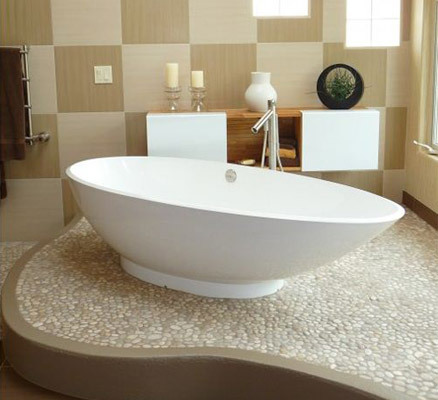 Bathroom floor pebble tiles are the most popular choice for bathroom. Pebble tile has all the features of water resistance, scratch resistance and stain resistance tile which a bathroom floor always needs. Pebble Tile Floor does not soak the water into the tile and also there are no cracks for water to get under as these stone tiles are grouted and sealed when installed. Pebble tiles are really easy to clean. These are multi colored in looks so most stains will simply fade into the colors of the stone to maintain its beautiful appearance. Visit our showroom or browse our inspired Bathroom tile gallery for array of design options, color schemes and bathroom pebble tile ideas. Whether you are installing a new or remodeling your kitchen backsplash, then choose River Pebble Tile Backsplash that comes in variety of colors, and sizes to match any decor or room. Pebble tile backsplashes are less expensive as compared to other material like, ceramic and concrete. Pebble Stone backsplashes are impervious to water and other liquids. These tiles are practical choice for backsplashes as they do not stain easily and are very easy to clean. These are versatile in high temperature, thus easy to be used for both kitchen and bathroom backsplash. By carrying the full collection of Pebble Tile and their various offerings we are ensuring our customers that final installation is as unique and stunning as they envisioned it to be. Pebble tiles do look beautiful when fitted in the home. Do you want to change your flooring? Yes. But you are afraid of mess up. No need to worry. Contact our designer experts provide best tile services that will help you to create and install a new pebble tile floor. Westside tile and Stone offers you the highest range of Pebble Stone Tiles with array of colors options and design schemes in any size as per your requirement what you rarely find anywhere. 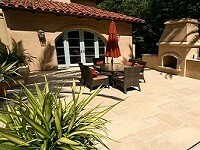 Westside tile and stone is working for more than two decades in Southern California. Whether it’s tiles or stone flooring, we give the best to our customers for indoor and outdoor until their satisfaction.